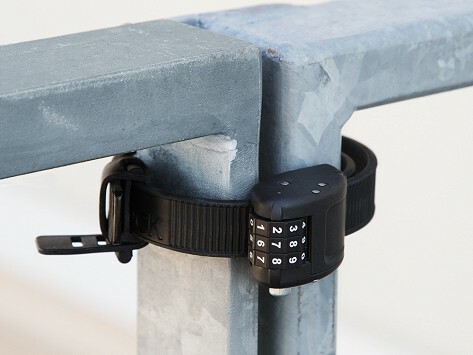 Secure your ride—and just about anything else—with a lightweight bike lock that merges a cinch tie and a combination lock in one durable and flexible (not to mention compact) design. The Kevlar® fiber and stainless steel band is cut-resistant, and the aluminum lock is smash-proof, making this lock stronger than some others and easier to take along with you, too. Weight: 18" Lock: 0.32 lb. ; 30" Lock: 0.39 lb. ; 60" Lock: 0.57 lb. Many cyclists lock up their bikes with a traditional U-lock, but do so begrudgingly—which is how OTTOLOCK was born. This lightweight, tough, and easy-to-use alternative won't weigh you down like a cumbersome U-lock can. OTTOLOCK comes from pro cyclist Jacob Rathe and co-founder Jake VanderZanden who teamed up to lighten up typical lock bulk without sacrificing security. It is Made in the USA with a cut-resistant Kevlar® fiber, a stainless steel band, and a smash-proof aluminum combination lock. The adjustable cinching design is more versatile than other locks we’ve seen and works great with gear like a bike, grill, or anything you want to secure. The bendable design coils up into a three-inch diameter when it isn’t on guard duty.